“The Flat” by digital author Andy Campbell, is a multimedia work of electronic literature. The author, in combination with digital studio Dreaming Methods, has woven together an interesting form of storytelling by combining text, flash animation, still images and sound. Though non-linear, this work is a narrative, because as Lev Manovich points out, “narrative creates a cause-and-effect trajectory of seemingly unordered items (events)” (Manovich, 255). The user controls the exploration of a small flat with their mouse. Moving the mouse moves a still image that has animated, clickable flashes urging the user to discover more of the narrative. When a user does click a clickable area, it “moves” them throughout the flat by showing another room or area of the flat. Words appear on the screen to move the story along. The work creates an incredibly eerie environment, and exploring the digital flat makes one feel as if a ghost might pop out at any moment. 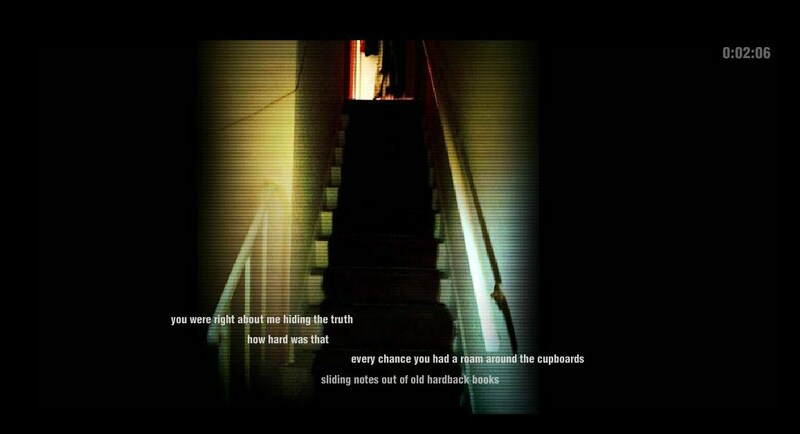 At one point, a face briefly appears from the shadows in a closet. Though there is never a specific, linear and easy to follow story, one could argue that the work is cinematic in the sense that the work combines sound, images, and animation to tell a story. This work, however, does not feature any video. It has video-like glitching effects, and sometimes provides the illusion of movement, however it doesn’t appear to ever use film or video. It does, however, use similar techniques, for example, the music sets a tone of fear, the writing feels mysterious, the movement of the mouse and imagery creates a feeling of uneasiness (much like camera movement in video). It is a very interesting and well done work of multimedia storytelling.